An exciting new CD from America! 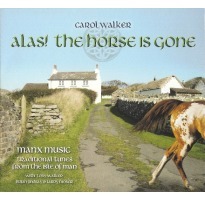 Carol Walker brings her own unique interpretation to Manx music. The CD features fifteen tunes from her book played beautifully on the Appalachian mountain dulcimer, harp, piano, melodica, upright bass, and vocals. Other musicians who feature on several tracks include her husband, Toby Walker and Brian Lindsay, a fiddle and whistle player. To purchase the accompanying book 'Tailless Tunes', please go the book section of this website.